Ubisoft's senior vice president of sales and marketing says what we've all been thinking: Most of the next-gen launch titles are underwhelming. The PS4 launched last week, and the Xbox One launches this week. Regardless, Ubisoft's Watch Dogs won't be making an appearance until next year. Tony Key, Ubisoft's senior vice president of sales and marketing, says system launch titles underwhelm because teams have little time to polish the game before the console launches. At the same time, there are several PS4 and Xbox One titles also available on PS3 and Xbox 360, such as Ubisoft's Assassin's Creed IV: Black Flag. In this transitional period from one console generation to the next, it's hard to make a game available for two different generations that different. "Right now, all publishers are transitioning their development resources," Key said. "For a game like Assassin's Creed: Black Flag, most of the sales are still going to be on current generation platforms. We can't make a version for PlayStation 4 or Xbox One that's so wildly different that we can't market them together. So, for now, developers and designers are focused on making a game that works really well on all of the systems - but as we transition resources to the next gen, it's going to be more difficult to do that because the power of these machines is going to allow so much more creativity." Games releasing for a new console's launch can be rushed, and developers are still learning about the PS4 and Xbox One. Key called the decision to delay Watch Dogs "heartbreaking" but an easy business call. "Watch Dogs is designed to be a long-term brand for Ubisoft," Key said. "We won't launch it until we know it's equaling the vision it can achieve... We're playing the long game - and as a company, we know how important it is to get it right." 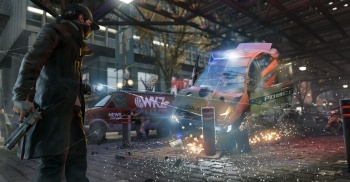 Key believes by pushing back Watch Dogs to polish it, Ubisoft will see more sales than it would have had the game launched already for the PS4 and Xbox One. He added that as developers experiment more with the new systems, innovation will build. "That's what we need," he said. "We need to bring excitement back to this industry."